Here’s performance in a velvet glove! Something really special does occasionally happen in the world of motoring and to me one such incident has been the recent arrival on the UK market of the Infiniti car range, the luxury brand from Nissan. Infiniti might be new to us but the brand has been in existence for some 20 years, selling on selected markets that does not even include Japan, so I feel the UK is honoured, the customers bound to be exclusive as not a lot of cars will be allocated to this country. The Infiniti marketing strategy is very specific, clearly honouring the customer as an individual who will always have recourse to a named contact on the rare occasion that communication about the car might be necessary. The sales outlets will be few and far between, just a handful across the country but they are really special as I witnessed at the opening of the first one in Reading, Berkshire. Surely it is a 5-star luxury hotel incorporating a very upmarket car showroom? That was my impression on arrival and in many ways I was right, except this establishment had no bedrooms, simply a dedicated location where the potential customer can create exactly the car he/she desires and see it in reality on a big screen, change the colours of the body or the upholstery, see what it looks like on different wheels or tyres and even thumb through large cut examples of the leather upholstery in a myriad of colours and shades. No plastic cups here, just designer crockery and fresh real coffee as the customer gets into a creative mood. And when a car is ready for collection it arrives, ready to drive away from a special collection area of the showroom, no chancing the elements and searching around in the back yard. All very well, but does the product live up to the show that’s been put on? 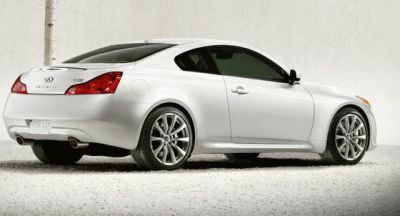 You bet, I found out by driving the very first Infiniti G75 Coupe to arrive on these shores. For starters all versions, including saloons, coupe, cabriolets, SUVs etc., are powered by V configuration engines either petrol or diesel fuelled and are of sensible rather than outrageous capacities, though providing exceptionally effective power outputs and attendant refinement. Power in this instance comes from a 3.7-litre unit developing 370 bhp in an ultra sooth and free revving manner and delivering its potency though a seamless changing 7-speed electronically activated automatic gearbox (an option over the 6-speed manual unit) that worked well with the speed control cruise system. The interior is luxurious, clearly painstakingly put together in a near art-form but all in very good taste as I would expect. Power assistance enables the driver to achieve an ideal seating position in the fine leather upholstered seating that gave me the impression of a good fitting master tailor class of suit. Accommodation for three other occupants is to a similar high standard and the access to the rear seats is relatively easy thanks to the large front doors. That something special comes home when one drives this Infiniti. To a very great degree the driving character reminds me of the 350/370Z sports Coupe models, more GT character than sport saloon and worthy of an engine that is claimed to provide a top speed mechanically limited to 150 mph and acceleration to 60 mph in a mere 5.5 seconds. Expect a fuel consumption of around 36 mpg on motorways, about 10 mpg less under combined conditions that does not look too selfish for this class of car. Clearly there is a lot shared with the saloon version which ensures a great deal of practical lifestyle including a luggage compartment that is bigger than a lot of sporting coupes…there is even diagrammatic instruction on how to stow two seats of golf clubs! Infiniti has clearly created a product that is identifiable for good taste, a modern product for dynamic owners who take for granted all the accoutrements of a well equipped car – voice recognition navigation system, rear camera, 7-speaker audio system, front/rear parking sensors, heated seats etc – and then demand more. If those demands include sheer driving enjoyment, great comfort, superb handling qualities and an air of exclusivity then log into the Infiniti experience. Rivals include: Audi A5 Cabriolet 3.2 V6 Quattro £41,150. NISSAN: The new Nissan Cube, just on sale, is reported to retain strong residual values, Nissan reporting that the £14,000 1.6-litre petrol model will be worth 49% of the new price after 3 years or 30,000 miles. TOYOTA: A completely restyled Toyota Auris range has been launched with prices from £14,463. A new British built hybrid version, the Auris HSD, will be available from July.